I joined Twitter back in 2010 and then promptly did what a lot of people do. Had a quick look, felt completely overwhelmed and then didn’t look at it again for around 5 years. With only 140 characters to make my point and not really having any idea of what that point was I decided it wasn’t for me. What with hashtags and mentions, squeezing in a link and possibly an image it all seemed like hard work and many of the Tweets I was reading could have been written in a foreign language for the amount of sense it made to me. Fast forward to now, March 2018, and I would probably agree with the quote above. In 2015, when I started my own small business blog, I realised I was going to have to do something to get visitors to those painstakingly crafted posts and ultimately to my website. In the last 12 months I have won two new projects as a direct result of Twitter. At just under a month in my most recent blog post has already received 2,000 visitors. Last but not least, I’ve forged some online relationships that have helped all aspects of my business beyond converting to new customers. Back in 2015 when I realised I was going to have to take some action to get traffic to my blog and website, one of the first things I did was to start following other small local businesses. Many of them were as active as I had been. In other words, they’d created an account and Tweeted a handful of times followed by a sustained period of inactivity. One of two profiles stood out, simply because they were more active and seemed to be Tweeting daily. So I followed them and started to engage. A like (or favourite back then) here and the odd retweet there. Some of them followed me back and eventually I was brave enough to comment on some of the Tweets. This lead to further interaction and a couple of direct messages with a local marketing company. As we were close geographically and shared some common ground with the type of customers we were hoping to attract we decided to meet up for a coffee. And that is how a happy working relationship was established. Since that initial meeting, we have both made various referrals to each other’s businesses and eventually some three years later towards the end of last year I was asked to work with GPC Marketing on the re-development of their website. This one is slightly less easy to quantify but looking at the analytics of both my Twitter account and my website I can see an increase in engagement on Twitter which correlates to the increased number of visits each blog post receives. My early blog posts were lucky to reach double digits by the end of the first month of publishing. Now most posts are reaching 2,000 or more within a month. Generating 5 or more tweets from each post with links back. These are all scheduled several times on different days of the week at various times of the day. Acknowledging and engaging with pretty much anyone who struck up engagement with me. Sharing content that would be of interest to my audience that didn't directly compete with my offering. As my activity on Twitter has increased I have seen an increase in engagement and traffic to my website, which ultimately has generated more work for my small business. This one has probably been of the most benefit to me and my small business. As well as bringing new customers to my business Twitter has proved an invaluable resource and I’ve managed to forge relationships with others who have supported me and offered advice in many ways. As a small business, I often work alone and don’t have anyone to share ideas with or ask when I’m not sure where I’m heading. Being a small business or freelancer can be a lonely old experience. Sharing that experience as well as celebrating my own and others successes within that online community has only ever been a positive experience. I’ve met people who have been able to provide technical support and I have now outsourced work to on occasion. I’ve interacted with experts in services relating to the mine, for example social media, and learnt a huge amount from reading their Tweets and online material. I’ve ‘met’ some lovely friendly people who have interacted and very generously shared my content and retweeted me which has all helped massively with growing my business. 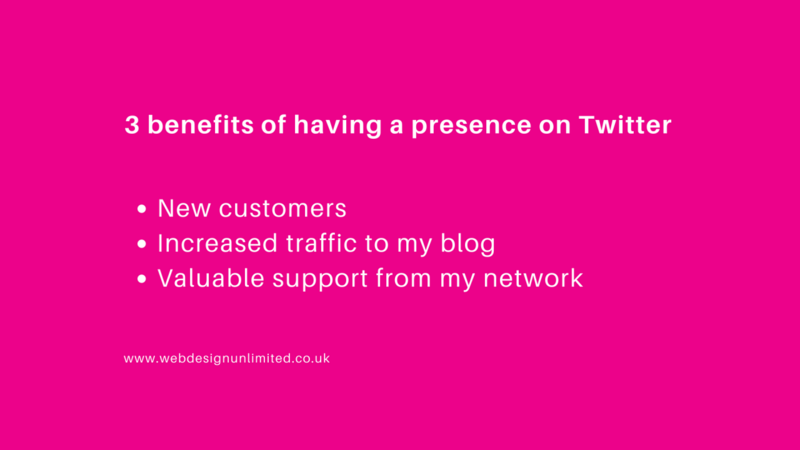 Having an active engaged presence on Twitter will benefit your business. You don't need to aspire to tens of thousands of followers, but being part of an online community that gives you access to a whole wealth of information and support, not to mention potential customers can only benefit your small business. I haven't spent hours and hours. I've used scheduling tools for regular Tweets and I look at my notifications and interact as often as I can ... quite often in the queue at Sainsburys! It really is just like going to a networking meeting, but you're doing it without leaving your desk. Unless you're at the supermarket of course!